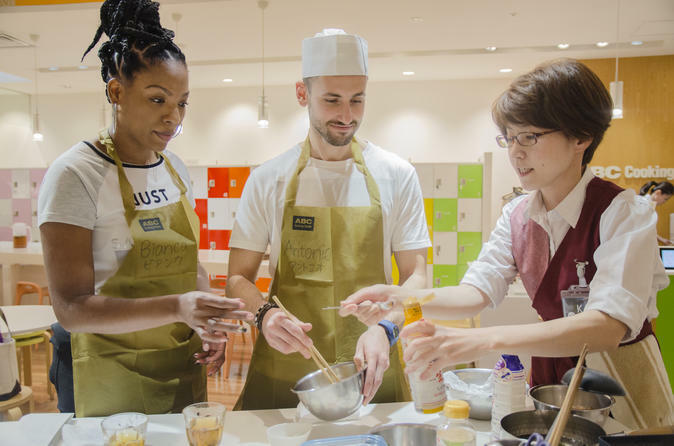 This is a small, private 3-hours class in central Tokyo, taught by a professional instructor at one of Japan’s largest culinary schools, boasting more than 150 studios throughout Asia and over 250,000 members. In this class you will thoroughly learn about the fundamentals of Japanese cuisine, from ‘dashi’ (soup stock) to seasonings and the art of plating. *Children, those with allergies and/or dietary restrictions may be accommodated for upon request. Meet your instructor at 11:00 am in front of reception at one of three of ABC Cooking Studio’s central locations. Your cooking station will be a fully-equipped, modern kitchen; kitchenware, aprons, kitchen towels, chef’s hats and beverages are all included! The menu will be a combination of 4 meals or more, preselected by you, along with an introduction to ‘Wagashi’ or Japanese confectioneries, which is Dorayaki (honey pancake), Sakura Mochi and a Matcha Latte. All menus are centered around ‘Dashi (soup stock), the basis of Japanese culinary culture. You will learn how to arrange and make use of Dashi for a variety of Japanese meals. Being a private class, our instructors will be completely available to you to answer any questions you may have regarding Japanese cuisine. In addition, they will inform you of local cooking styles and particular techniques that make Japanese cuisine unique and elevated. Finish your experience having lunch and with a sampling of 5 different Shochus (Japanese National alcohol) of various ingredients such as rice, barley, brown sugar, sweet potato and mango. Shochu is different than “Sake" as it is distilled while sake (called Nihonshu in Japan) is a brewed rice. You can enjoy Shochu not only on the rocks or straight, just like whiskey, but also with soda and juice which is called Sour Coktail. (Please note that you CANNOT take away any meal except Bento Box and Wagashi). Receive free samples, informational pamphlets and a certification before you go!